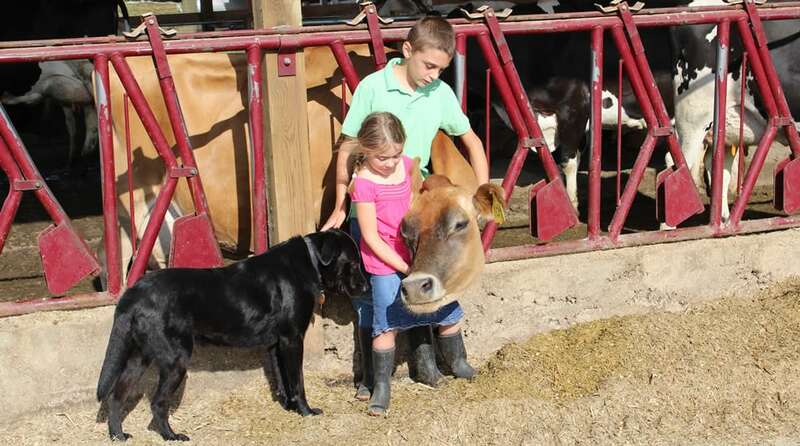 Hupps Dairy Farm, located in Licking County, is home to 240 dairy cows and 1,000 acres of crops which are cared for by Josh and Jenn Hupp and family. The Hupps are proud of the wholesome milk they produce and that it provides their family and community with essential nutrients. Describe your farm and what it means to be an Ohio dairy farmer. Josh: For us, dairy farming really isn’t a job – it’s a lifestyle. It’s what I always wanted to do and it is the way we wanted to raise our family. What does it mean to raise your kids on the farm? Josh: My kids are always out here playing with their 4-H animals and helping us with our everyday chores. You can’t ask for a better way to teach kids hard work and pride. Jen: They love the farm. It’s always an argument to see who gets to help dad with the cows. My daughter is the real cow girl though, she’ll spend hours with the cows. How do you give back to your local community? Josh: We live in a small community and regularly volunteer at the local food pantry at our church. Our family will help unload deliveries from the county food bank truck. Dairy is an item that is lacking in our food pantry. Approximately 5 percent of what they receive may be dairy and very little of that is fluid milk or cheese. As a dairy farmer, I’m very proud to partner with milk processors to support the Great American Milk Drive to give milk to people who cannot afford it.